It’s a bird, it’s a plane. No, it’s a whale shark! Whale sharks are the largest fish in the sea but much of their behaviour is still unknown. In a world-first, we’ll be attempting to hit the marine jackpot and determine how old whale sharks are using DNA samples. We’re also placing trackers on them to discover where in the ocean they travel and how deep below the surface they go from one of their favourite hangouts – Ningaloo Reef in Western Australia. We are tagging these majestic beasts at Ningaloo Reef to understand how they interact with the Reef’s ecosystem, as well as their movements to other parts of Australia and around the globe. Whale sharks are immense in size and can grow to 12 metres in length. They are slow moving and love chowing down on krill. They gravitate to Ningaloo Reef because it offers an abundance of food at this time of year. One in six whale sharks that cruise around Ningaloo Reef are male. The whereabouts of all the females remains a bit of a mystery. 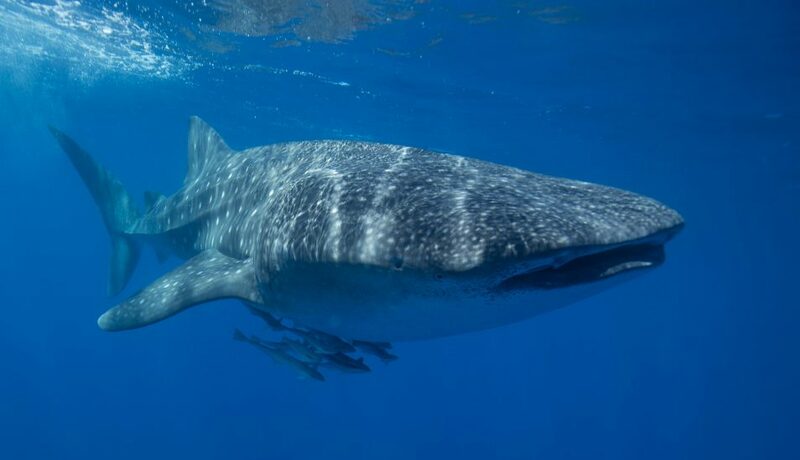 Whale sharks visit Ningaloo Reef from March to September, but are migratory and have been recorded travelling thousands and thousands of kilometres in all directions. Satellite tags give us a view from above, providing location information and insight into diving behaviour which is really important to understand what they are doing and why they are doing it. Our tags have revealed that whale sharks travel as deep as 1.8km from the ocean’s surface. They also venture quite a distance with some whale sharks turning up at Christmas Island, 1500kms from Ningaloo Reef, and even the Gulf of Carpentaria, 3500kms away! One challenge with tagging is that it’s difficult to keep them attached. Some tags have stayed on for as long as nine months, giving us long-term migration information over several thousand kilometres. It’s an age thing: how old is a whale shark? In short, no one knows. During this field trip, we’re researching genetic ageing, which has never been attempted before on sharks or fish before. Genetic ageing provides a critical piece of information: the whale shark’s life history. Taking DNA samples will help determine how old the whale sharks are, including their age at any measured length, how long it takes them to mature and how long they live for. Putting these pieces of the puzzle together is vital so we can estimate how many whale sharks there along the Western Australian coast and east Indian Ocean. To identify individual sharks over multiple years of sampling and to gain accurate estimates of length and growth we’ll photograph each animal and record it using stereo video. Recording the unique patterns on whale sharks will enable us to identify each individual. Our whale shark research is just one part of our Ningaloo Outlook research project, a $5.4 million, five-year partnership with BHP to deepen our understanding of the Ningaloo Reef ecosystem that provides shelter and food for a diverse range of marine life like sea turtles. We are also quantifying marine debris in the area, with data indicating Ningaloo Reef as one of the cleanest reefs in the world, including surveying the coral reefs to understand and monitor changes to the environment and how to protect this marine environment for the future. It’s not only scientists that are involved in our research at Ningaloo Reef – we work closely with the community, including the local school, who are dab hands at helping us gather data. We also hold an annual competition to name the tagged whale sharks and turtles we find with the winners announced at the Exmouth Whale Shark Festival. The most recent tagged whale sharks have been named Eddy, Morse and Tiny. Immerse yourself in our Ningaloo Outlook research, including keeping track of whale sharks and turtles from the comfort of your mobile or computer. “One in six whale sharks that cruise around Ningaloo Reef are female. The whereabouts of all the females remains a bit of a mystery.” Are the males the mystery or the females? Whale shark behavior is still very elusive – for both female and male. 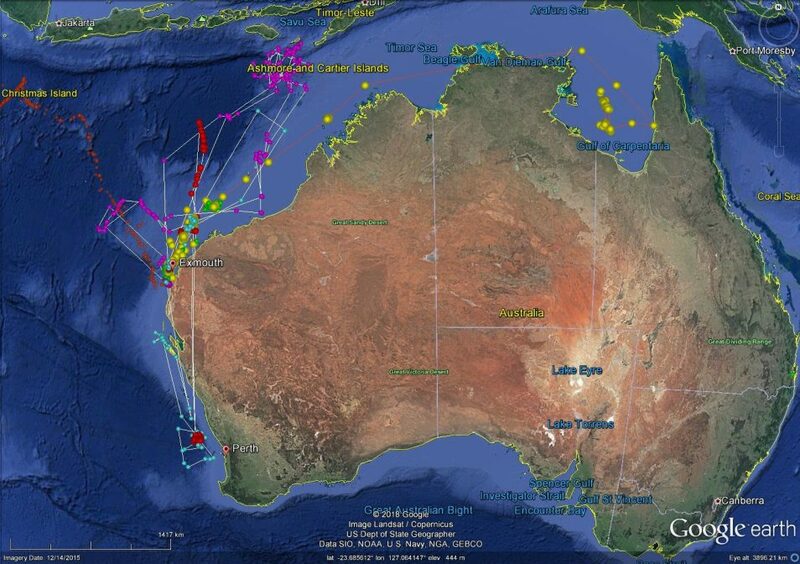 Most of the whale sharks tagged at Ningaloo Reef so far have been male. Once we learn more about them, we might be able to know why and where they go. We hope this helps! can you explain what the colours on the map means? is each colour a whale shark? Yes, each colour on the map is an individual whale shark. Map does not show location of Ningaloo??? Exmouth is the town where the pin is (the westerly shoulder of Australia) and it’s off the coast there where Ningaloo Reef is and where the whale sharks are tagged.